KATHMANDU, Dec 29: The commission formed to restructure local units under the new federal system is all set to submit its final report to the government and has fixed as many as 716 local units across the country. According to a highly positioned source at the commission, it has finalized its report fixing 455 village councils, 245 municipalities, 12 sub-metropolitan cities and 4 metropolitan cities under the new federal system. 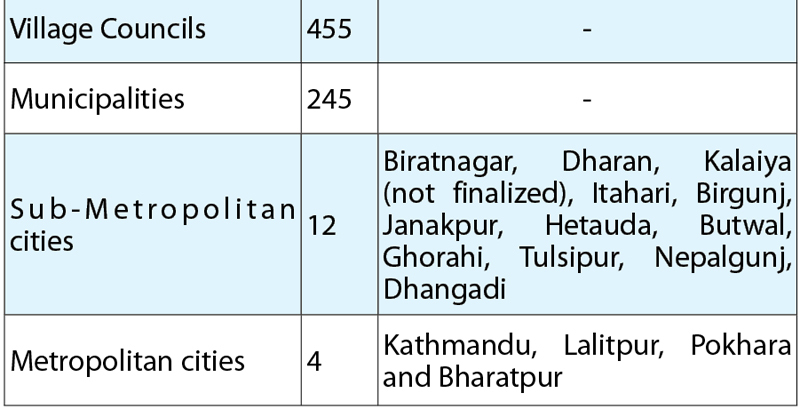 The commission has fixed Kathmandu, Lalitpur, Pokhara and Bharatpur as metropolitan cities while Biratnagar, Dharan, Kalaiya (not finalized), Itahari, Birgunj, Janakpur, Hetauda, Butwal, Ghorahi, Tulsipur, Nepalgunj, and Dhangadi have been fixed as sub-metropolitan cities, according to the source. In the existing setup, Kathmandu is the only metropolitan city in Nepal while Laltipur, Pokhara, Bharatpur, Biratnagar, Dharan, Itahari, Birgunj, Janakpur, Hetauda, Butwal, Nepalgunj, Dhangadi are sub-metropolitan cities. But in the new federal system, Lalitpur, Pokhara and Bharatpur are being upgraded as metropolitan cities while three municipalities Ghorahi, Tulsipur and Kalaiya are going to be upgraded as sub-metropolitan cities in the new setup. Many existing villages have been annexed with the cities that have been upgraded to metropolitan cities and sub-metropolitan cities to meet the standards set by the commission for a city to be metropolitan and sub-metropolitan cities, informed the source. In the mountain region, village councils will have 5 to 9 wards while municipalities will have 9 to 11 wards. Similarly, in the hilly region, village councils will have 5 to 12 wards while municipalities will have 9 to 14 wards. Similarly, in the Kathmandu Valley as well as in the inner tarai and tarai, village councils will have 5 to 15 wards while municipalities will have in between 9 to 18 wards. Likewise, the 12 sub-metropolitan cities will have 19 to 27 wards while the four metropolitan cities will have 28 to 34 wards, according to the commission. Officials of the commission, however, said that the number of village councils that has been fixed by the commission so far could be changed as lawmakers from Bajhang and Syangja have been pressuring to increase the number. The commission said that it has fixed service center of each of the local units keeping in view of public access to the center. "The service centers recommended by the commission in mountain region can be reached in maximum four hours, three hours in hill region and two hours in tarai area," said the official. Though the commission has fixed the numbers and boundaries of the village councils and municipalities, it is yet to fix special, protected or autonomous areas,” added the official. "We will fix the areas later as the government asked us to fix village councils and municipalities in the first place and submit the report to pave way for local polls. We will fix the areas after submitting the report to the government but they will be fixed before mid-March, 2017," said Sunil Ranjan Singh, a member of the commission. The tenure of the commission will expire in mid-March. The commission has already sent a letter to the prime minster to schedule an appointment to submit its report on new local units. Once the commission submits its report to the government, the existing local setup will automatically transform into the village councils and municipalities created by the commission.